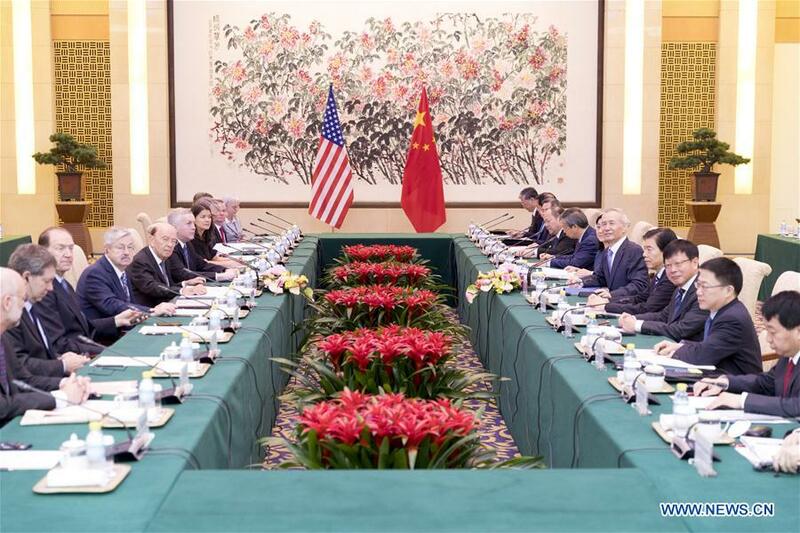 BEIJING, June 3 (Xinhua) -- Chinese and U.S. teams, led by Chinese Vice Premier Liu He and U.S. Secretary of Commerce Wilbur Ross, held economic and trade consultations in Beijing from June 2-3, according to a statement issued by the Chinese side. "To implement the consensus reached in Washington, the two sides have had good communication in various areas such as agriculture and energy, and have made positive and concrete progress while relevant details are yet to be confirmed by both sides," the statement said. Liu is also a member of the Political Bureau of the Communist Party of China Central Committee, and chief of the Chinese side of the China-U.S. comprehensive economic dialogue. "The attitude of the Chinese side remains consistent," said the statement. To meet the people's ever-growing needs for a better life and the requirements of high-quality economic development, China is willing to increase imports from other countries, including the United States, which will benefit people of both countries and the rest of the world, it noted. "Reform and opening-up as well as expanding domestic demand are China's national strategies. Our set pace will not change," the statement said. The outcome of the talks should be based on the prerequisite that the two parties meet each other halfway and will not engage in a trade war, according to the statement. "All economic and trade outcomes of the talks will not take effect if the US side imposes any trade sanctions including raising tariffs," the statement said.